Marion Lorne MacDougal or MacDougall (sources differ) (August 12, 1883 – May 9, 1968), known professionally as Marion Lorne, was an American actress of stage, film, and television. After a career in theatre in New York and London, Lorne made her first film in 1951, and for the remainder of her life played small roles in films and television. Her recurring role as Aunt Clara in the comedy series Bewitched, between 1964 and her death in 1968, brought her widespread recognition, and she was posthumously awarded an Emmy Award for Outstanding Supporting Actress in a Comedy Series. Lorne was born in West Pittston, Pennsylvania, a small mining town halfway between Wilkes-Barre and Scranton. She was the daughter of William Lorne MacDougall MD, and his wife, Jane Louise (née Oliver), known as "Jennie". She was born in 1883 (although by the 1920s she had shaved five years off of her age). While her year of birth is listed as 1885 in some sources, including the date inscribed on her urn (which appears to be erroneous), it was usually listed as 1888 when she was alive. The 1900 United States Census (enumerated in June 1900) gives her age as 16  and, along with the Social Security Death Index (SSDI), lists her year of birth as 1883. Her parents were Scottish and English immigrants. She had a younger brother, Lorne Taylor MacDougall (October 20, 1893 – September 5, 1943). She studied at the American Academy of Dramatic Arts in New York City. Lorne debuted on Broadway in 1905; she also acted in London theaters, enjoying a flourishing stage career on both sides of the Atlantic Ocean. In London she had her own theater, the Whitehall, where she had top billing in plays written by Walter C. Hackett, her husband. None of her productions at the Whitehall had runs shorter than 125 nights. After appearing in a couple of Vitaphone shorts, including Success (1931) starring Jack Haley, she made her feature film debut in her late 60s in Strangers on a Train (1951), directed by Alfred Hitchcock. From 1952-55, she was seen as perpetually confused junior high school English teacher Mrs. Gurney on Mister Peepers. From 1957-58, she co-starred with Joan Caulfield in the NBC sitcom Sally in the role of an elderly widow who happens to be the co-owner of a department store. Although afraid of live television, declaring "I'm a coward when it comes to a live [television] show", she was persuaded to appear a few times to promote the film The Girl Rush with Rosalind Russell in the mid-1950s. Between 1958 and 1964, she made regular appearances on The Garry Moore Show (1958–1962). Her last role, as Aunt Clara in Bewitched, brought Lorne her widest fame as a lovable witch who is losing her powers due to old age (and whose spells usually end in disaster). Aunt Clara usually visited by coming down the chimney; her hobby was collecting doorknobs, and she often brought her collection with her on visits. Lorne had an extensive collection of doorknobs in real life, some of which she used as props in the series. She appeared in 27 episodes of Bewitched and was not replaced after she died of a heart attack in her Manhattan apartment on May 9, 1968, aged 84, prior to the start of production of the show's fifth season. She is buried at Ferncliff Cemetery in Greenburgh, New York. The producers of Bewitched decided that Lorne's character as Aunt Clara could not be replicated by another actress. Comedic actress Alice Ghostley was recruited to fill the gap as "Esmeralda", a different type of older witch with wobbly magic whose spells often went astray. Coincidentally, Lorne and Ghostley had appeared side-by-side as partygoers in the iconic comedy-drama film The Graduate, made the year before Lorne's death. She received a posthumous Emmy Award for Outstanding Supporting Actress in a Comedy Series for her work on Bewitched. The statue was accepted by Bewitched star Elizabeth Montgomery. In 1911, she married playwright Walter C. Hackett. They were married until his death in 1944. The couple had no children. August 21, 1955 The Ed Sullivan Show variety Herself in "The Girl Rush Show"
^ a b c According to the 1900 United States census, MacDougall was born in 1883. However other sources cite 1885, including the urn in which her ashes are held, or 1888, which no longer has any credibility. 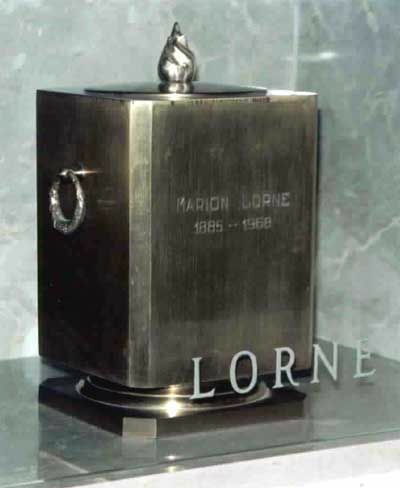 ^ a b "Marion Lorne". Find a Grave. Retrieved October 7, 2012. ^ Jeb H. Perry (1980). Variety Obits: An Index to Obituaries in Variety, 1905-1978. Scarecrow Press. p. 175. ISBN 978-0-8108-1289-5. ^ 1900 census record for Marion Lorne MacDougall, although her middle initial appears as "M", not "L", ancestry.com; accessed September 22, 2015. ^ a b c d The Magic of Marion Lorne. TV Guide, March 23–29, 1968, pp 20-21. ^ "Information Booth" (PDF). Radio-TV Mirror. 41 (1): 12. December 1953. Retrieved November 17, 2014. ^ "Sally (1957 TV series)". Classic TV Archives. Retrieved September 11, 2009. ^ "Aunt Clara's Doorknob Collection". Nick at Night Flashback. September 23, 2008. Retrieved July 16, 2009. ^ "Heart Attack is Fatal to Marion Lorne". Gettysburg Times. May 13, 1968. Retrieved June 1, 2014. ^ "When Esmeralda Sneezed". harpiesbizarre. October 1, 2007. Retrieved October 1, 2007. ^ a b c d e Database (undated). "Marion Lorne". emmys.com (database operated by Academy of Television Arts & Sciences). Retrieved October 7, 2012.